Turkey, officially the Republic of Turkey is a transcontinental country, located mostly on Anatolia in Western Asia and on East Thrace in Southeastern Europe. The capital of Turkey is Ankara. 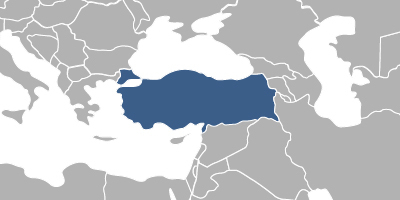 Turkey is bordered by eight countries: Bulgaria to the Northwest, Greece to the West, Georgia to the Northeast, Armenia, Iran and the Azerbaijani exclave of Nakhchivan to the East, and Iraq and Syria to the Southeast. The territory of Turkey is subdivided into 81 provinces for administrative purposes. The biggest city and the pre-Republican capital Istanbul is the financial and economic centre of the country. Fees associated with registration of IP rights in Turkey are available in the fee calculator.